Red sedge is a small, perennial herb; the creeping rootstock grows to lengths of 30 feet but is very thin. It produces stiff, grooved, triangular flower stalks sheathed with linear leaves which separate from the stalk near the bottom or at various points along its length. Small terminal spikes of tiny, green, inconspicuous flowers appear during May to June. Grows on riverbanks, wet embankments, shorelines, and other sandy soils from France to northern Europe. A different variety of sedge (C. ex-siccata) or Tall swamp sedge, was used by Native Americans to make very fine baskets. The root of the sedge is used. The Native American name: Matso-zump. The root is buried in still warm ashes, with water added. This makes a fine black. Also root baskets are made from roots of a sedge (C. mendocinoensis), Pomo name, “Kahoom”, or water-gift. These long roots sometimes reach 5 or 6 feet in length. They are soaked overnight in water, and the weaver peels off the bark or outer skin and rolls it in small coils. The remaining root can be split into many strands, used as “Boms” for foundation. 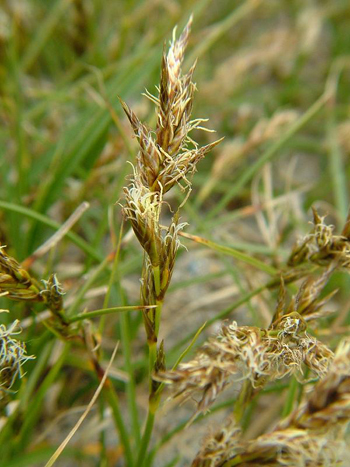 There are sedges, called blackroot sedge, which have a central section, coal-black, which color can be deepened by burying in manure of in blue mud. Nebraska sedge (C. nebraskensis), Cut-your-finger, “So-yo-toi-yis”, a favorite food of buffalo, is tied around the horns of the buffalo head in the Sun Dance. The root has sometimes been used for gastro-intestinal catarrh, colic, chronic constipation, and for coughs and hoarseness. In mild cases of tuberculosis, the rootstock’s silicic acid content may be useful in stabilizing scarred tissue. For various skin problems, take red sedge as a diaphoretic tea. Decoction: boil 2 tbsp. rootstock and roots in 1 cup hot water. Take 1 cup per day, warm. Cold extract: soak 2 tsp. rootstock and roots in 1 cup cold water for 8 hours. Take 1 cup per day. Do not use when acute kidney inflammation is present.